Two men died when a small plane plummeted to the ground near a suburban Philadelphia airport Sunday afternoon, police said. The plane -- a Piper PA28-- crashed into a wooded area near Saunders Lane and Andrews Drive in West Goshen, Chester County killing both people on board around 1:45 p.m., officials confirmed. "Shortly after taking off the plane started to sputter and then basically took a nosedive and came down in the woods," said Bob Fleming, of Goshen Fire Company. It had taken off minutes earlier from the Brandywine Airport, which is roughly two miles from the crash site, police said. 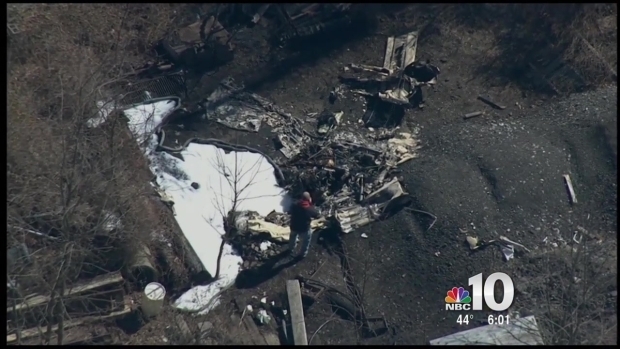 Officials said the last deadly accident out of Brandywine Airport was 10 years ago. The small plane crashed Sunday afternoon shortly after taking off from the Brandywine Airport in Chester County. Investigators say one of the two men killed in the crash is local to West Goshen Township. Witnesses on the ground suggested the single-engine Piper PA-28 may have lost power -- the engine sputtering -- and then stalled before crashing into the woods and bursting into flames. "We couldn't see anything, just heard a big bang," said Frank Kraus, a neighbor. Kraus added he was thankful the tragedy was not any worse, considering the proximity of several homes and a large senior living housing complex to the crash site. "Thank God for the pilot," he said. "But then the pilot and his passenger didn't make it which is sad. Sad to hear that people didn't make it." The identities of the victims have not been released and it's unknown at this time what caused the plane to crash. Authorities confirmed at least one of the victims is a West Goshen Township resident. Local authorities and the Federal Aviation Administration are investigating. Officials with the National Transportation and Safety Board are expected to arrive Monday to aid in the investigation. The Piper PA28 went down Sunday afternoon shortly after taking off from Brandywine Airport in Chester County. NBC10's Randy Gyllenhaal speaks with witnesses who heard the plane sputter before the crash. Oddly enough, a similar Piper aircraft also crashed Sunday in Virginia, killing a teenage student pilot.